I’ve long been a fan of Exotac. They take traditional survival tools and truly bring them to the next level. The nanoSPARK is no exception. On the surface, it is simply a spark lighter. But, it is unlike any spark lighter you’ve seen before. For starters, it is crafted from CNC machined aluminum. It is lightweight yet very solid. No cheap plastic here. Four colors are available: Gunmetal Grey, Blaze Orange, Olive Green, and Black. The body of the nanoSPARK is textured to provide a positive grip in all weather conditions. End to end, it is roughly 2.5 inches and it is about 0.5 inches thick. With a handy lanyard attachment point, this is a fire starter that is perfect for EDC or your bug out bag. Here’s where the nanoSPARK rises way above the competition. It screws apart to expose a storage capsule inside. It is designed to store one quickLIGHT, which is an Exotac brand tinder. It will also store standard size tinder tabs or you can fashion your own ready-to-light tinder from cotton balls and petroleum jelly. This capsule is waterproof, sealed with a rubber O ring. The last thing you want is for your tinder to get wet in a driving rain or an accidental plunge into a pond. The nanoSPARK arrives with a packet of five quickLIGHTs and extra flints, too, so you’re ready to go from the moment you open the box. 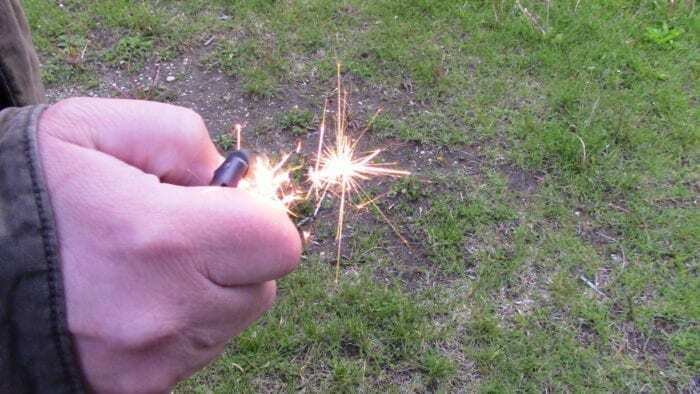 If you’ve ever used a disposable lighter, you already know how to use the nanoSPARK. Simply rotate the wheel with your thumb and a hot spark is generated. 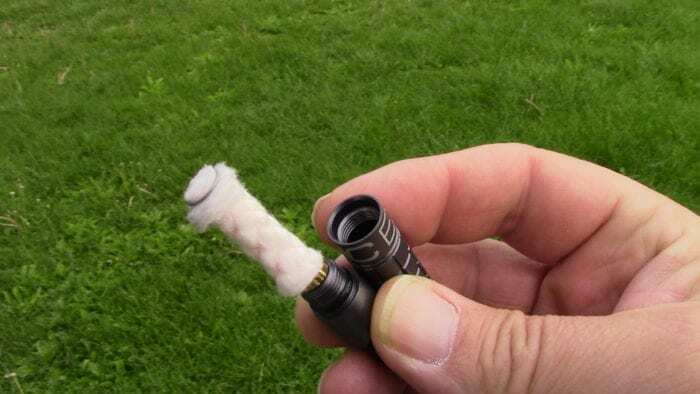 It utilizes a small piece of flint, not unlike the ones used in standard Zippo style cigarette lighters, and the flint is replaceable. The nanoSPARK works well with any tinder that lights with a spark, such as InstaFire and Wet Fire Cubes. Exotac has a great line of firestarters to choose from. The nanoSPARK can be purchased for around $25 or so. 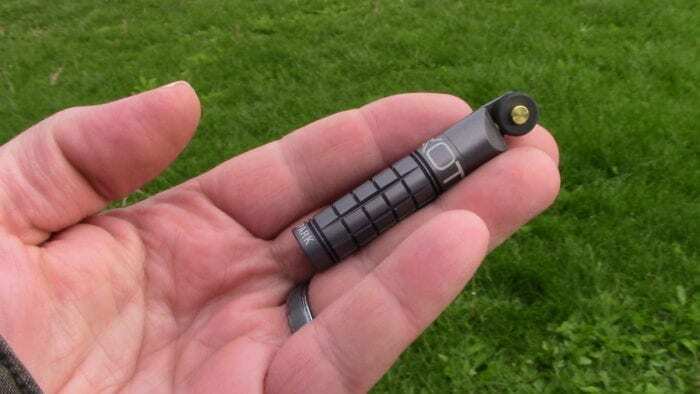 While this price point is a little higher than some of the other spark lighters out there, none of them are as well-designed and, near as I can tell, none of them have a waterproof chamber for tinder built right in to the unit. Why a nanoSPARK versus other types of fire starters? Well, let me say this first. The best fire starter I’ve ever used is a simple butane lighter. It is instant flame. But, they will fail in extreme cold as well as when they run out of fuel. The nanoSPARK works one-handed. Simply place the working end next to your tinder and spin the wheel. It truly doesn’t get much easier. Now, what are the odds that you’ll not only be in a critical situation but you’ll have one hand injured as well? I’m not enough of a mathematician to make that determination. I’ll say this, though. I don’t want to find out the hard way. Exotac has another homerun on their hands with the nanoSPARK. It is a classic type of Firestarter brought into the 21st century. To view the entire line of Exotac firestarters, click here. What do you think about the nanoSPARK? Do you have your own preferred firestarter? Let us know in the comments below. If you enjoyed this article and want more like it, let us know by sharing, liking, and commenting on this post. Have questions you need answered or have an idea of what we should cover next? We are pleased and excited to welcome the highly esteemed Jim Cobb to Bug Out Bag Academy ranks. Jim is the owner and lead trainer for DisasterPrepConsultants.com. His seasoned experience and witty, well articulated articles on preparedness have been published in national magazines such as OFFGRID, American Survival Guide, Survivor’s Edge, and Boy’s Life. You can find him online at SurvivalWeekly.com. His growing stack of accomplished books on emergency preparedness include Prepper’s Home Defense, Prepper’s Financial Guide, and Prepper’s Long-Term Survival Guide, among others. Jim lives in the Upper Midwest with his beautiful wife and their three adolescent weapons of mass destruction. What is the Best Bug Out Bag Food For You?